Show your appreciation for Roger the Dodger when you don this Heritage Roger Millward Hall of Fame Great Britain 1970 Rugby League Polo Shirt. Roger Millward played and coached rugby league from the 1960s until the 1990s. A goal-kicking stand-off, he gained a high level of prominence in the sport in England by playing for Hull Kingston Rovers, who he captained, and Castleford, as well as representing Great Britain. Millward was awarded the Order of the British Empire (MBE) in 1983 and was nicknamed "Roger the Dodger" for his elusive running. In 2000 he was inducted into the Rugby League Hall of Fame. 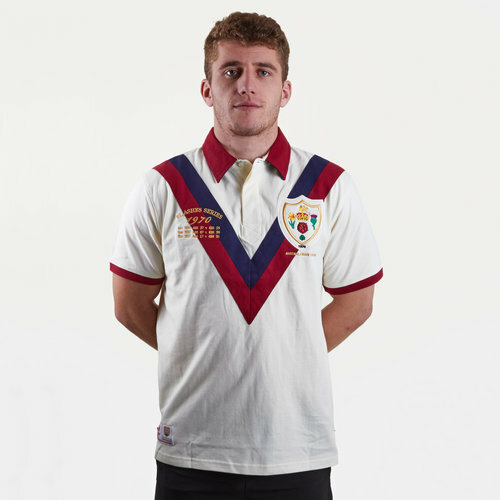 This vintage polo was inspired by Roger Millward’s outstanding contribution to the 1970 Great Britain Ashes Test winning team down under. It is made from 100% chunky pique cotton and features detailed embroidery, including an appliqué badge as well as an embroidered collar stand.